Choosing your baby room paint colors can be a difficult process. There are so many to choose from, it can seem overwhelming at first. Don't worry; all you need is a starting point to get you going in the right direction. On this page I will give you some tips to help you with finding your starting point. If you are looking for a fail safe, gorgeous baby nursery color scheme, you can't go wrong by starting here. It makes coordinating your nursery colors an absolute breeze! Nursery pictures are your best source of inspiration when it comes to choosing your nursery colors. Look at as many as you can find. There are plenty of baby nursery pictures scattered throughout this site. Spend some time and browse around. Otherwise you can visit the ever-expanding baby rooms gallery. If you're still stuck for ideas check out this brilliant book I use: The Smart Approach To Baby Rooms, by Joanne Still. It's literally jam-packed with beautiful, inspirational baby nursery photos. You are sure to find something in here to get the brainwaves moving. Take your nursery decorating style into account. Certain color schemes work better with certain styles. For instance grey and yellow would work in a modern nursery, while green and violet pastels would be more suited to a traditional style. Think about your personal color preferences. Are there any colors that you particularly like or dislike? Write these down so that you can exclude or include them when you start looking at your baby room color wheel. Your baby's gender will help you to narrow your choice of colors down one more step. Do you want to stick with tradition, (pinks and blues) or do you want something more modern? Look at the size of your nursery room. If it is large you will want to make it cozy by using warm baby nursery paint colors such as red, pink, orange and yellow. Large rooms also accomodate the use of dark colors. If your baby nursery is small you can make it appear larger by using cool colors such as blue and green or neutrals including white, cream, ivory, beige and brown. Be careful not to make the colors too dark. Monochromatic or single-color schemes also work well in a smaller room. If you have chosen to use a nursery theme, take the colors the theme lends itself to into account. Are you going to be incorporating a mural into your nursery design? The background to your mural will account for at least one of your main baby nursery colors. For instance, if your mural is going to be a landscape you will need a blue background for the sky. Another great option is to start by looking for a nursery bedding set that you like. Pull out the main colors and base your baby room paint colors around it. It covers every color scheme under the sun. There are hundreds of pictures to give you ideas and even comparisons of the same room in up to eight different color schemes. You really can't go wrong with this book on your shelf! I hope these baby room paint color tips help you to narrow things down a bit. 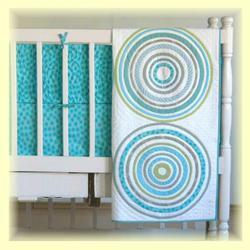 Take a look at the other articles about baby nursery colors on this site for more help.